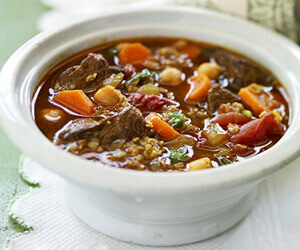 This beef, bean, and vegetable soup is loaded with spices, including cumin, ginger, and garam masala. It makes a satisfying low-calorie meal. In a 5- to 6-quart Dutch oven, heat olive oil over medium heat. Add cumin seeds. Cook and stir for 10 seconds. Add garlic, salt, garam masala, ginger, turmeric and cayenne pepper all at once to oil mixture. Cook and stir for 15 seconds (watch closely to avoid burning). Add half of the meat and half of the onion to spice mixture; cook and stir until browned. Remove meat mixture with a slotted spoon (it's okay if some of the onion remains in the pan). Add remaining meat and onion. Cook and stir until meat is brown (adding more oil if necessary). Return all meat and onions to Dutch oven. Stir in beef broth and undrained tomatoes. Bring to boiling; reduce heat. Simmer, covered, for 45 minutes, stirring occasionally. Stir in the garbanzo beans, bulgur and carrots. Return to boiling; reduce heat. Simmer, covered, for 20 to 25 minutes more or until meat, vegetables and bulgur are tender, stirring occasionally. Stir in parsley just before serving. Makes 8 main-dish servings.